TURNS HIS HOBBY INTO A LIFE'S WORK. Konrad Schiecke standing next to one of his two dozen rebuilt 35mm movie projectors. 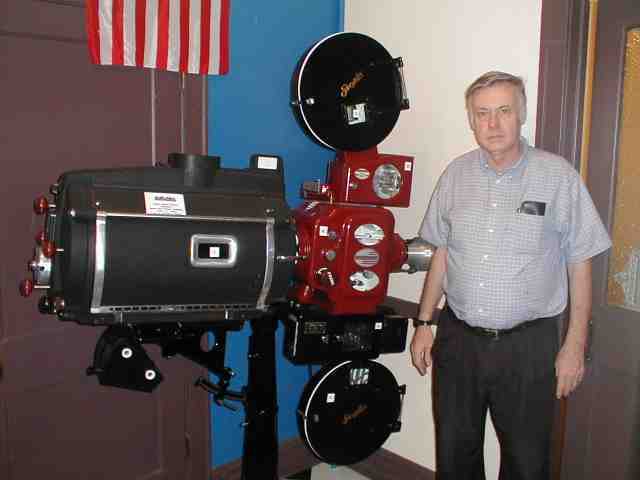 Konrad donated this projector to the THSA museum and archive above the York Theater in Elmhurst, Illinois. Konrad has turned his lifelong hobby of collecting and rebuilding theater movie projectors into a retirement project. As a volunteer, about twice a month, at the Theater Historical Society of America, National Headquarters, Konrad helps the society maintain its archives while keeping himself up-to-date on events in his area of interest. Konrad is in the process of writing a book about movie houses in Illinois, and has plans to write another about theaters in Wisconsin. 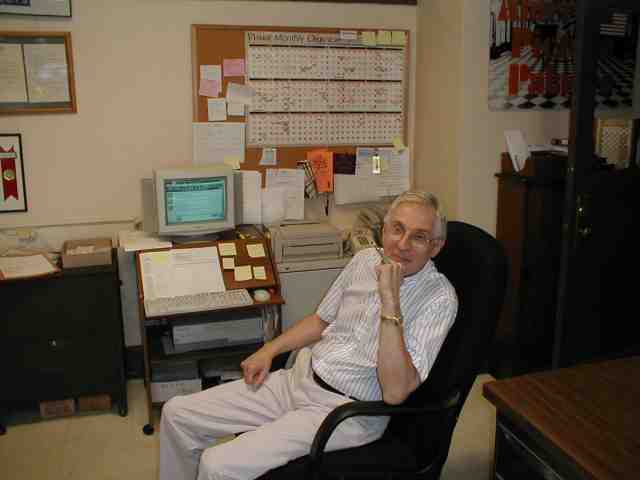 My wife, Bess, and I visited Konrad on the job on Wednesday, Sept. 10, 2003. The Executive Director of the society, Richard Sklenar, also welcomed us to the museum. 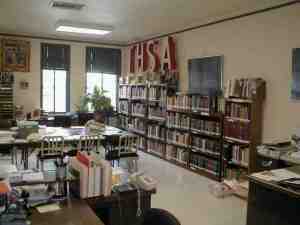 He shares his office with the society's library shown below. The day we were there, Konrad was busy filing articles about theatre information. He also assists with requests for information from the archives by members of the society world wide.